This IRB-approved prospective study enrolled 59 consecutive patients (mean age, 43.9 ± 16.6 years; F:M 18:41) with known or suspected pulmonary TB. Patients underwent a low-dose CT (LDCT) using automatic tube current modulation followed by an ULDCT using fixed tube current. Raw image data were reconstructed with filtered-back projection (FBP), hybrid iterative reconstruction (iDose), and IMR. Objective measurements including CT attenuation, image noise, and contrast-to-noise ratio (CNR) were assessed and compared using repeated-measures analysis of variance. Overall image quality and visualization of normal and pathological findings were subjectively scored on a five-point scale. Radiation output and subjective scores were compared by the paired Student t test and Wilcoxon signed-rank test, respectively. Compared with FBP and iDose, IMR yielded significantly lower noise and higher CNR values at both dose levels (p < 0.01). Subjective ratings for pathological findings including centrilobular nodules, consolidation, tree-in-bud, and cavity were significantly better with ULDCT IMR images than those with LDCT iDose images (p < 0.01), but blurred edges were observed. With IMR implementation, a 59% reduction of the mean effective dose was achieved with ULDCT (0.28 ± 0.02 mSv) compared with LDCT (0.69 ± 0.15 mSv) without impairing image quality (p < 0.001). IMR offers considerable noise reduction and improvement in image quality for patients with pulmonary TB undergoing chest ULDCT at an effective dose of 0.28 mSv. 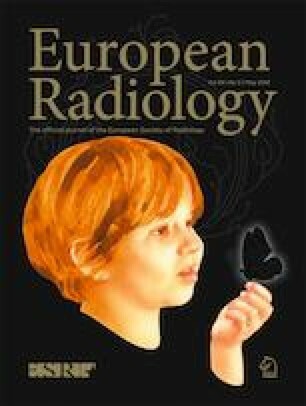 • Radiation dose is a major concern for tuberculosis patients requiring repeated follow-up CT.
• IMR allows substantial radiation dose reduction in chest CT without compromising image quality. • ULDCT reconstructed with IMR allows accurate depiction of CT features of pulmonary tuberculosis. The authors would like to thank Dr. Yan Jiang from the Philips Healthcare for providing technical support. This study has received funding by the National Key Research and Development Program of China (grant 2016YFC0107104) and the Science and Technology Planning Project of Guangdong Province, China (grant 2015B010131011). The scientific guarantor of this publication is Prof. Yikai Xu.